Forex (foreign exchange or currency markets trading) has typically been viewed as too risky and demanding for mainstream investors. However, thanks to the new global money printing craze hitting central banks everywhere, as they “race to debase” their currencies, it’s clear that now all investors need to cope somehow with the threat of steadily weakening dollars, euros, yen, and other local currencies that join the “race to the bottom” as governments seek to protect exports and stimulate growth via the questionable path of money printing. Savvy investors understand that they‘ll see their wealth dragged down with their local currencies, even worse than what’s already happened to those based in US dollars over the past decades, as demonstrated in the article, 7 CHARTS TELL WHY WE ALL NEED CURRENCY DIVERSIFICATION. In sum, most of us are faced with a huge dilemma. On the one hand, the usual kinds of forex trading are widely seen as too risky and demanding, and not without reason. The vast majority of new traders fail at forex. On the other hand, we need ways to diversify into the more responsibly managed currencies or assets linked to them. Everyone needs forex, but most need simpler, safer, less demanding ways to play these markets than those commonly used, regardless of whether they’re active traders or passive investors simply seeking investments linked to more responsibly managed currencies that will retain their value or appreciate. These solutions exist, but are not yet well known. Recently I published the first forex book ever that provides mainstream investors with both a one-stop collection of these safer, simpler, less demanding ways to diversify currency exposure using forex markets, and the background needed to apply these methods profitably. Brenda Jubin kindly posted a review the book (see here), and in doing so she’s done us all a real service by helping raise awareness that the solutions are there for the taking, so I strongly recommend taking 5 minutes that might well make you a better investor. She’s provided a lucid, and overall very perceptive review, clearly written by a real pro. She makes it look so easy. It isn’t. Having reviewed some books myself, I know how hard it is to capture the essence of a book in so few words. Bravo, Ms Jubin. It’s a short, fun read of a topic that any investor needs to be aware of. That said, though she sounds smarter than me, here are some corrections and elaborations readers should consider. As the author, I know the book better, but despite my best efforts to be objective, I’m under suspicion of being biased. You decide. Wachtel breaks little new ground in this book, but he offers a solid, far-reaching course in trading. Beginners will learn a great deal (even though, if they have little experience in the markets, they will have to stretch to grasp everything). For those who have yet to trade profitably, the book may serve as a useful refresher course. Even investors who think that “trading” is a four-letter word will discover how to use currencies to diversify their portfolios and to ride long-term forex trends for lower risk, higher income. Though she sounds a lot smarter than me, I disagree on a few points, and respectfully offer them for your consideration. Actually, there’s quite a bit that’s new. If you look through the available titles on Amazon.com, virtually all forex books, even those for beginners, focus on short term, highly leveraged trading that is riskier and more demanding in terms of time and skill than most investors will feel accept. In contrast, this book offers a range of solutions that avoid these disadvantages so that the vast pool of mainstream investors, who’ve never tried forex, can feel comfortable using at least a few of them that fit their needs. They’ll have a much easier time surviving the learning period with their confidence and capital intact, and so have a much better chance of being profitable once they gain the requisite experience on practice accounts and with small positions when they first graduate to trading with real money. –For aspiring mainstream active traders, it’s the first forex book to focus on providing a collection of simpler, safer, less demanding ways to trade currencies than found in virtually all other forex guides. Just skim the book offerings available for proof. –For passive investors, who are generally put off by forex’s reputation as a high risk trader’s market, the book provides guidance on how to identify the strongest long term currencies and how to integrate that knowledge in building a portfolio that’s prudently diversified by currency as well as by the usual criteria. Ms. Jubin does mention this as the sole truly new material, but a little elaboration is in order. This alone is big deal. These are really important and useful topics, and just this section represents more than just “little new ground,” unless you insist on judging solely by numbers of pages. Even if you do, there’s another 50 pages of supplementary material on the pros and cons of binary options that’s coming soon to the book’s website, as mentioned on page 216. Social trading allows those with minimal background and capital to have an expert trade for them, with better transparency and lower costs than with traditional managed forex accounts. That alone is a big deal. As long as readers learn how to choose the right expert (discussed in the book), they should see the much better results that should come with using a proven expert. As far as I know, the book has the only objective material on the pros and cons of binary options: when and how to use them in a prudent manner. As mentioned at the start of this section (page 216), because the topic is so vast, I had to offload the full 50 page report to the book’s supplemental website (coming soon-held up for technical reasons). If you can get just one really useful new idea out of an investing book, be thrilled. So far I’ve offered a number of them, which by themselves take the book beyond the “breaks little new ground” stage. The nature of gold and thus what really drives gold prices. The real relationship between the US dollar and stocks. OK, strictly speaking, this isn’t new ground because I doubt I’m the first one to see these relationships, but coverage of them is rare enough that they’ll be new for most readers. Moreover, I’ve yet to see these covered in any forex book. Then there’s the material that involves new applications of existing ideas to forex. Certainly that should get partial if not full credit as new material. If you learn a new way to use an existing tool, you’ve learned something new. Included in this category are the following. There’s nothing new about trading or investing based on longer term time frames, but go find a forex book that gives more than a passing treatment about using them. This book goes in depth in multiple places on the why and how of using longer term trends and time frames, and explains the much ignored dangers of the popular day trading methods, in which the big institutional traders have huge advantages over the inexperienced individual trader. The book also is the only one I’ve seen that integrates use of these long term currency pair charts into long term investing in stocks, bonds, and other assets. I imagine someone has done this somewhere, but go find it in a forex book or book on long term foreign investing. Most the forex books for beginners tend to be either too superficial to actually get you ready to make money, or to overburden readers with so much detail that they don’t know where to begin and what information to start using in order to actually start trading. Call me biased, but this book succeeded in striking a rare balance between the extremes. Given its nearly 400 pages, some may argue that’s a lot of detail. I say no, and claim this is the minimum length for a book of this scope. II. Enough Coverage of Fundamental Analysis? Granted, fundamental analysis is a huge topic, I’m writing a practical guide to making money , not a comprehensive book on the topic, so how much is enough is a judgment call. I hold that I gave the reader plenty to get started trading successfully, and for good measure threw in an extensive appendix of free online resources for further education. In sum, Ms. Jubin wrote an accurate, insightful review, though there is more new or at least rare material than she suggests. How much? Enough to justify this book being one of the standards for both forex traders seeking a different perspective, and for mainstream investors seeking conservative ways to diversify their currency exposure or simply understand how forex markets can help them invest in or trade other markets. Am I right? I should be, though my feeble book marketing skills may doom it to being yet another good book that never gets on the radar of the audience that needs it. Curious? 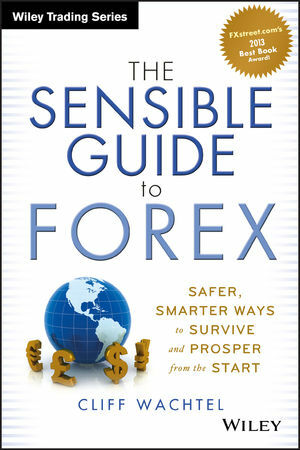 Just enter the title in your search bar to find the detailed descriptions and reviews on the book’s amazon page and my own site, http://www.thesensibleguidetoforex.com – see the About and Review tabs. DISCLOSURE: In case it wasn’t completely clear, I’m the author of The Sensible Guide To Forex. ← COMING WEEK MARKET MOVERS: EARNINGS, ECONOMIC REALITIES, OVERRIDING STIMULUS OPTIMISM?